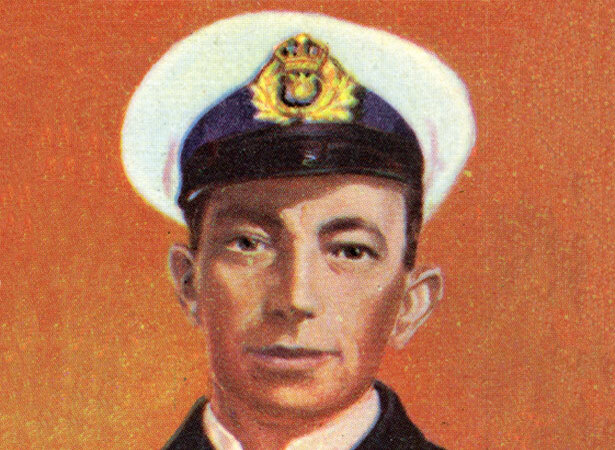 William Sanders received the Victoria Cross (VC) for bravery during a German U-boat (submarine) attack on his ship. He became the first – and only – New Zealander to be awarded the British Empire’s highest military decoration in a naval action. Sanders, a Royal Naval Reserve officer, assumed command of HMS Prize in February 1917. Prize was a Q-ship, an armed merchant vessel designed to deceive and destroy enemy submarines. Prize was attacked by German submarine U-93 during a patrol south-west of Ireland. The U-boat shelled the schooner for nearly half an hour, hitting it several times, before approaching. As the shells rained down, Sanders crawled along the deck, organising his crew. When U-93 was just 70 yards away, Prize hoisted its naval ensign, dropped screens hiding its guns and returned fire, destroying the submarine’s forward gun and conning tower. Because the existence of Q-ships was a secret, the military authorities did not reveal the details of Sanders’ VC award until after the war. Sanders did not receive the resulting accolades. He and his crew had perished in another U-boat attack on the night of 13/14 August 1917. We have 6 biographies, 3 articles, related to William Sanders awarded New Zealand's only naval VC.